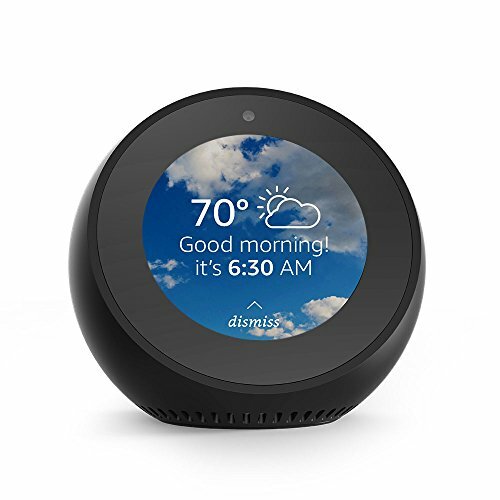 Amazon takes on the old alarm clock and modernizes it in their second video enabled Alexa device. The Echo Spot is a bit pricy but provides a fun, attractive clock with all the goodness of Alexa packed inside. When Amazon released the Echo Show last Summer, it felt a bit underwhelming. An Amazon Echo with a screen seems like a great idea, but it’s clunky design and lack of video-specific skills didn’t live up to it’s hefty price tag. But perhaps more importantly, it didn’t feel like it had a purpose in the home. That’s where the Spot steps in. The Amazon Echo Spot is a more compact version of the Echo Show with a purpose in mind. It’s a smart clock that can be placed next to your bed or on your desk. It packs all the features of the Echo inside with just enough of a video screen to make it worthwhile. And with it priced in-between the Echo and Echo Show, it’s our pick for those looking to utilize Alexa in video form. The Spot is the best looking Echo device Amazon has put out to date. The circular design provides a modern look that seamlessly fits on a nightstand or bookshelf. The matte plastic shell comes in both black or white. The bezels inside contrast with the shell to really make the screen pop. The blue light which illuminates when Alexa is triggered looks terrific too. It’s a sharp contrast from duller Echo designs of the past. The cornerstone of the device is the 2.5 inch round screen. The 480×480 resolution might not seem impressive on paper, but at its size it’s more than adequate. Colors really pop no matter the room lighting and there is no glare even at the highest brightness setting. It’s wide viewing angle is impressive and makes it perfect for a clock. While the touchscreen had the occasional hiccup, you’ll rarely be using it and it shouldn’t be a factor. 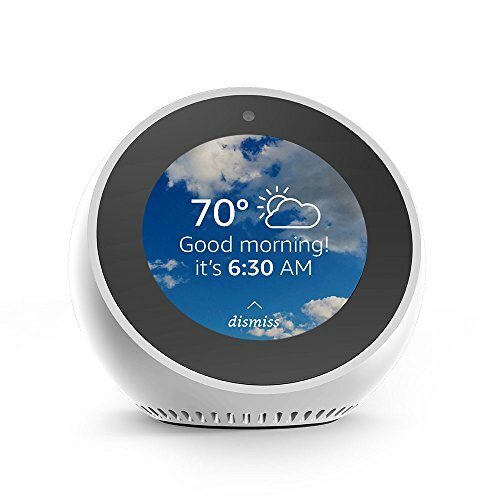 While the focus of the Echo Spot has been on it’s video screen and seemingly perfect fit as an alarm clock, it’s important to remember it’s still an Echo device. It features the same seamless setup that other Echo products have, albeit now with a helpful screen to guide you. And it comes with the same lovable Alexa we find in our standard Echo or Echo Dot. For those unfamiliar with Alexa, it’s the virtual smart assistant that powers all of the Amazon Echo devices. On the Spot, this is done through the microphone array on top that can detect commands from impressive distances. If you have multiple devices in the home, Amazon’s ESP (Echo Spatial Perception) will pick up the one closest to you automatically. When it comes to playing music, Alexa is ready to answer. You can link up your accounts with Spotify and Pandora. iHeartRadio and TuneIn are included if radio is your thing. And of course Amazon Music comes already integrated if that’s your preference. All this gets played through the Echo Spot’s 1.4 inch built-in speaker. The speaker is adequate in a smaller room, but does suffer at higher volumes due to some flatness and lack of base. I’d say better than the Echo Dot but behind the standard Echo. Perhaps Alexa’s most important function is the ability to connect to other smart home products in the home. It can connect to your Nest thermostats so you can adjust the temperature with a simple voice command. It can connect to smart plugs so that you can turn on a lamp in a room. There are thousands of products that are Alexa enabled and Amazon is the clear leader in compatibility at this time. Besides listening to music and home automation, Alexa can handle daily tasks for you. It can answer questions for you, provide you with daily news, even set a timer. You can have it text a friend, pull up a sports score, or give a weather update. While Alexa isn’t quite as polished as Google’s smart assistant, it’s abundance of 3rd party skills still gives it an advantage in this area. The Echo Spot is built to be used as a clock. Amazon has created a number of analog and digital clock faces that can be chosen in the settings. They’re varied in style, attractive, and seem to be adding new ones on a regular basis. But perhaps my favorite clock face is using pictures from my own photo gallery. This can be done by uploading photos or using Prime Photos (if you are a Prime member already). This allows the clock to double as a digital photo frame with slideshow functionality included. Some other nice features with the clock is a night mode. This allows you to set particular times of day where the clock will dim automatically. Otherwise, brightness can be controlled at any time through the touchscreen settings or your voice. If you’re utilizing it as an alarm clock in the morning, the touch screen works as a giant snooze button (or you can just say “Alexa, snooze”). After the clock, the usefulness of the screen takes a dip. As we mentioned in our Echo Show review, having a screen doesn’t necessarily mean it’ll be used a lot. So while the concept is nice, there unfortunately aren’t enough skills that utilize video. Sure the weather will pop up when you ask for it. And it’ll throw up the album and artist on screen during a song. But I don’t find myself yearning for these features. Hopefully as adoption of the video Echo devices increase, more video skills will become available. I did however find some other uses for the Echo Spot’s video screen that came in handy. One is making video calls to others with either an Echo Spot, Echo Show, or Amazon Alexa app on their smartphone (it works like Facetime in that sense). The other is viewing an Alexa enabled security cam such as Amazon’s own Cloud Cam. Unfortunately, the screen is just not large enough to fully enjoy these luxuries. For short use like checking who’s at the front door it’s fine. But if you’re making routine video calls or pulling up security cams on a regular basis, the Echo Show’s larger screen is more suitable for you. As my home automation needs have increased, I’ve been needing more Echo devices to cover the home. So while a $130 alarm clock is tough to stomach, I look at the fact that I would be adding at least a $50 Echo Dot to my bedroom anyway. The extra $80 seems worth it for having a futuristic looking alarm clock that can display my favorite photos and check on the outside security camera. Privacy is perhaps the only thing that gave me pause with the Echo Spot. While Amazon has done an admirable job with their security, having a camera in your bedroom can be a bit unnerving. We’re at our most vulnerable in that room and it certainly takes some time to get used to. I can see people putting a piece of black tape over the lens like they do with laptops. Overall, I love the idea of the Amazon Echo Spot. I love that they took on a concept like your alarm clock and modernized it. Hopefully this trend continues. The Echo Spot is highly recommended if you’re looking to add Alexa to the bedroom in style.